In a rematch of last year's fall championship, the 2-seeded CBA Tigers look to avenge their loss against the undefeated 1-seeded Platoon. Both teams separated themselves from the pack, and with beautiful fall weather both days, this was sure to be a great battle. Sa turday morning opened with David Lira from the Tigers facing off with Zach Mercer from the Platoon. After a quiet first, Platoon made some noise in the bottom of the 2nd. Sal D'Angelo and Seth McGrath each singled, and with one out, Nick Schmidt singled. D'Angelo was cut down at the plate, and the Tigers would escape unharmed. 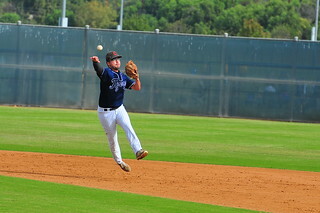 With momentum on their side, Jamie Dorado walked, and eventually moved to 3rd with 2 outs. A wild pitch brought him home, and gave the Tigers a 1-0 lead. In the bottom of the 5th, the Platoon got on the board due to some sloppy Tiger defense. Nick Schmidt and Eddie Knipps reached on back-to-back errors, and after a fielder's choice and a pop out, Chad Avena singled home Knipps to make it a 1-1 game. Both pitchers kept things quiet until the bottom of the 8th, when Platoon's hitters finally woke up. Avena doubled to lead off the inning, and Cole Gilmore followed with an rbi-triple. Sal D'Angelo wasted no time singling home Gilmore, and the Platoon took a 3-1 lead heading into the 9th. The Tigers didn't go down easy, with Niko Garcia walking and Angel Vega getting a single to lead off the inning, but a double play quickly ended the threat, and Mercer pitched the Platoon to a complete game victory, taking a 1-0 series lead in the process. 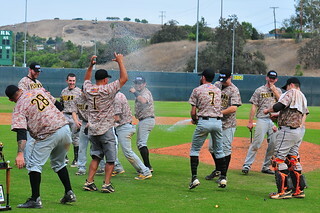 With Conejo Creek in pristine condition, game 2 looked to be in good hands. 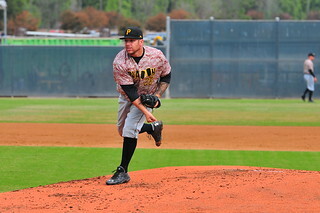 The pitching matchup set Nick Kaid for the Tigers against Sal D'Angelo for the Platoon. Platoon got out to an early lead. Chad Avena singled and moved to 2nd when Sal D'Angelo walked. 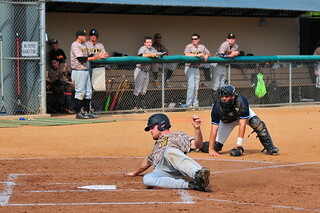 Both runners scored on a Steve McGrath single, giving the Platoon a 2-0 lead. Both pitchers settled down, taking us to the top of the 4th inning. D'Angelo leads off with a walk, and scores from first on Steve McGrath's double. Nick Schmidt doubles home McGrath, and with 2 outs, Robert Reeves Sr singles hom Schmidth, making it a 5-0 lead. The Tigers bats finally come alive in the bottom of the frame. Robert De Santiago singled, and Jerry Zaragosa singled him to 3rd. Jaime Juarez hit a sac fly to center, and put the Tigers on the board. After 4, the Platoon led 5-1. Tim LeSuer led off the top of the 5th with a triple, but Nick Kaid worked out of the jam by getting the Platoon's 2-3-4 hitters out and stranding the runner at 3rd. But the Platoon came right back in the top of the 6th. With 1 out, Jeff Bezjian singled and swiped second, and Nick Schmidt brought him home with a single to extend the lead to 6-1. In the bottom of the 7th, the Tigers began digging themselves out of the hole they'd created. Pinch hitter Danny Vega singled, and one out later, by Chad Ochoa, Nick Padilla and Tony Cabrera brought home Vega. But over-aggressive base running cost the Tigers, as Ochoa was thrown out at the plate and the Platoon escaped without further damage, still leading 6-2.
championship hopes alive. Leading off the inning, Chad Ochoa walked, and Nick Padilla singled. 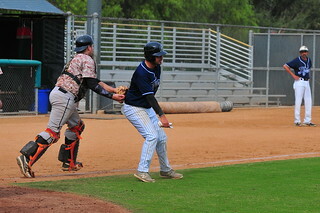 After a strikeout, Robert De Santiago was hit by a pitch to load the bases. 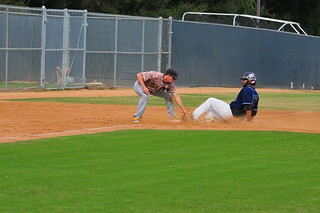 Jerry Zaragosa singled home a pair, bringing the go ahead run to the plate. 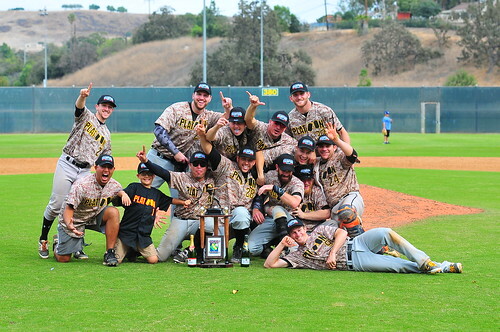 But D'Angelo settled down and got the next 2 batters to finish the game and bring home their 3rd straight fall title. Congratulations go out to the CBA Tigers, who had a great season and battled until the end. 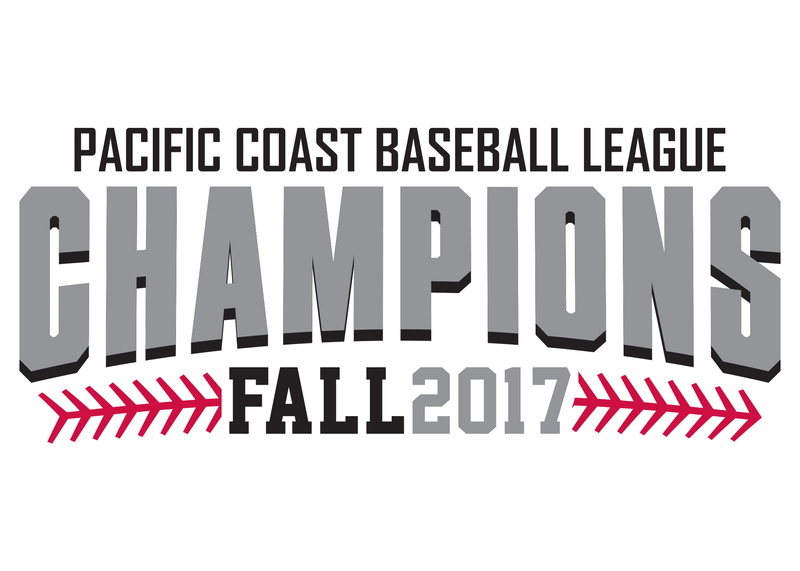 But for the 3rd straight fall, and this time without losing a game, the Platoon bathe in champagne and lift the championship trophy! Congratulations to the Fall 2017 Major-Division Champion Platoon!